Deric's MindBlog: Monkeys drumming - a gestural origin of speech and music? Monkeys drumming - a gestural origin of speech and music? Salient sounds such as those created by drumming can serve as means of nonvocal acoustic communication in addition to vocal sounds. Despite the ubiquity of drumming across human cultures, its origins and the brain regions specialized in processing such signals remain unexplored. Here, we report that an important animal model for vocal communication, the macaque monkey, also displays drumming behavior, and we exploit this finding to show that vocal and nonvocal communication sounds are represented by overlapping networks in the brain's temporal lobe. Observing social macaque groups, we found that these animals use artificial objects to produce salient periodic sounds, similar to acoustic gestures. Behavioral tests confirmed that these drumming sounds attract the attention of listening monkeys similarly as conspecific vocalizations. Furthermore, in a preferential looking experiment, drumming sounds influenced the way monkeys viewed their conspecifics, suggesting that drumming serves as a multimodal signal of social dominance. Finally, by using high-resolution functional imaging we identified those brain regions preferentially activated by drumming sounds or by vocalizations and found that the representations of both these communication sounds overlap in caudal auditory cortex and the amygdala. 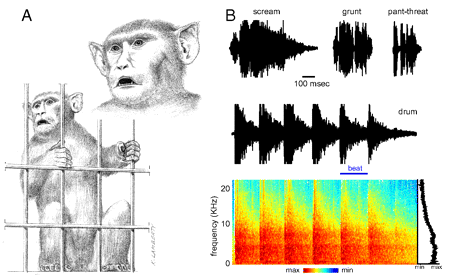 The similar behavioral responses to drumming and vocal sounds, and their shared neural representation, suggest a common origin of primate vocal and nonvocal communication systems and support the notion of a gestural origin of speech and music. Characteristics of drumming sounds. (A) In this example, a macaque drums by firmly grasping the cage door with his forelimbs and shaking it vigorously and repeatedly. The inset displays the typical facial expression during drumming: open-mouth threatening, staring, forward directed pinnae. (B) Drumming sounds are acoustically distinct from typical vocalizations such as screams, grunts, or pant-threats. The repetitive beat pattern of the drumming sound produced by this action is visible in the time-frequency spectrum. The black line displays the power spectrum. The most difficult problem in answering the question of how music creates emotions is likely to be the fact that assignments of musical elements and emotions can never be defined clearly. The solution of this problem is the Theory of Musical Equilibration. It says that music can't convey any emotion at all, but merely volitional processes, the music listener identifies with. Then in the process of identifying the volitional processes are colored with emotions. The same happens when we watch an exciting film and identify with the volitional processes of our favorite figures. Here, too, just the process of identification generates emotions. An example: If you perceive a major chord, you normally identify with the will "Yes, I want to...". If you perceive a minor chord, you identify normally with the will "I don't want any more...". If you play the minor chord softly, you connect the will "I don't want any more..." with a feeling of sadness. If you play the minor chord loudly, you connect the same will with a feeling of rage. You distinguish in the same way as you would distinguish, if someone would say the words "I don't want anymore..." the first time softly and the second time loudly. But how music can convey volitional processes? These volitional processes have something to do with the phenomena which early music theorists called "lead", "leading tone" or "striving effects". If we reverse this musical phenomena in imagination into its opposite (not the sound wants to change - but the listener identifies with a will not to change the sound) we have found the contents of will, the music listener identifies with. In practice, everything becomes a bit more complicated, so that even more sophisticated volitional processes can be represented musically.